» Protecting Albany airport from — what? 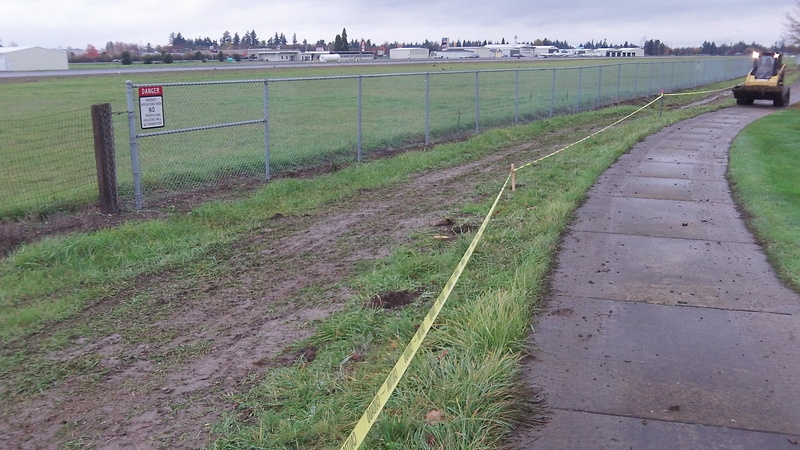 One segment of the new airport fence will go where the yellow tape is. The city of Albany is having a new fence put up at the city airport because, well, the government says it must. And that requirement raises a question: Is it necessary? The placement of the fence along the airport’s southeastern boundary prompted a discussion before the city council Monday. The city staff wants it built a little way inside the property, on the west side of Cox Creek, while the airport advisory commission fears this would signal a further shrinking of the airport, already reduced over the last 30 years by construction of the Linn County Fair and Expo Center and then a couple of hotels and a restaurant. The council seemed willing to pass a resolution affirming the present airport boundary regardless of where the fence is placed. That should settle that, but what about the fence itself, seven feet tall with barbed wire on top? The city says it’s the second phase of fencing started in 2008. The cost this time: $253,000, 90 percent of which is paid by the Federal Aviation Administration. Gordon L. Shadle: Why should it shock anyone that Albany is spending an excessive amount on an unneeded fence? 90% of the money is “free.” We live in a city that spent $11,000,000 for a train station (sorry, the official name is Albany Multimodal Station) with a copper roof and $1,600,000 on a 1,586 sq. ft. outbuilding. The feds chipped in 80% of the funding for that wasteful project. Albany will never turn down federal money if it’s “free.” Whether the spending passes the common sense test is irrelevant. The objective is the spending, not the need. If memory serves, the airport fence building surge began as a response to the attacks of 9/11. I’m not sure why anyone felt small local airports constituted a real potential threat from terrorists but it was, and is, clearly nonsense. The non-existent threat now seems to have grown, requiring expenditures of millions of dollars throughout the country for no apparent benefit. The carrot/stick enticements of the Feds only increases their power and bloats the budget (deficit/debt). We simply cannot keep on doing this. Why can’t we, “Just say NO!”?